I don’t consider myself a cinephile, but I was shocked at the shoddy quality of the roadshow presentation of The Hateful Eight. The projection was blurry on the edges, lines on the sides and wobbly. It reminded me of the highly used films that my junior high used to show at lunch hour – well that is an exaggeration, but I was expecting pristine visuals and to be visually blown away. My assumption is the renovated projector and an inexperienced projectionist are to blame. The idea was great: do an old style epic with state of the art antique equipment and present it roadshow-style like back in the late 50s and early 60s. I am an analog guy – I love my vinyl LPs – this should have been right up my alley. Oh well, a swing and a miss, but nice try. You won’t have missed a thing when you see it via DLP. So how was the movie? It was very much a Tarantino movie: wordy, visually clever, non-liniar plot, comical violence, great music, unabashed borrowing from other movies, etc. 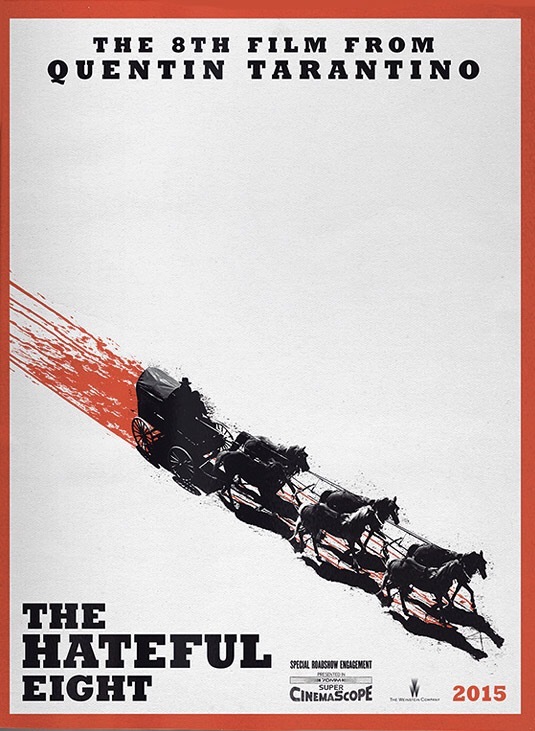 I love Tarantino movies, but frankly I found this one a slow and unadventurous. If you are a fan of Tarantino, love westerns and have a sick sense of humor you will like this move. I liked it – it just did not blow me away – but frankly Tarantino has not blown me away since Pulp Fiction (my all-time favorite film). The novelty of this movie was going to be the 70 mm analog film, when that stumbled, this movie became nothing more than another notch in Tarantino’s belt. We only have two Tarantino movies left – lets hope he blows our minds at least once more before he goes off to write the great American novel. haven’t seen it yet. Cooled off on his films.